Fruit juice for young children should be limited. For infants under six months, the American Academy of Pediatrics now recommend only human milk or a prepared infant formula. Research is showing that excess sugar without fiber has a large impact on causing diabetes and obesity in children. The Academy is now recommending limiting fruit juices in children. After their first year, the academy recommends that children can be used as part of a meal or snack, but should not be sipped throughout the day (as is encouraged by ads for “juice boxes” and sugary drinks). 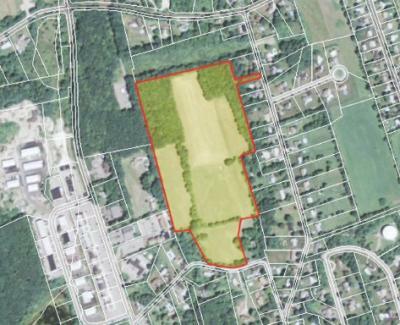 Last Saturday Morning we discussed the Avis Ave farm proposal from the last Town Meeting. It looks like the deal has fallen apart. A few years ago, the Fox family had proposed protecting the property via the Community Preservation Act program, but the Town Meeting at that time denied the proposal over cost. Over the last few years, a deal was made to have the state cover a good amount of the cost through the Agricultural Protection Restriction program, but the family never came forward to sign off on the deal and it expired. Now, the land will probably be developed into residential properties. The Girl Scouts this year are bringing the summer to us just as the winter comes in. The box arrived just in time for our last 980 WCAP Saturday Morning Radio Show program of the year, so we took a few minutes to try them out and see what everyone thought. I originally wanted to hear from Jake Martin and Tim Bomil of 980 WCAP’s food show, “The First Course.” Tim could not join us that morning, but Jake didn’t hesitate to grab some free cookies, giving our first opinion. Others liked the cookies, saything they were an acceptable new flavor. Myself, I thought the texture of the cookies was similar to their mint cookies (my favorite), but with a graham flavor and wrapped in a milk chocolate rather than a dark chocolate (though still a hard shell, so they will last). 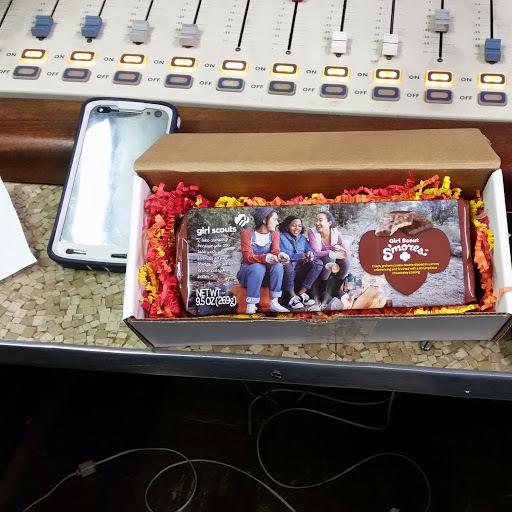 Saturday Morning Live host Warren Shaw, was just as positive as Jake, however, saying that even though he had long grown away from buying Girl Scout cookies (as his daughters have grown), if he were buying them today this would be his new favorite. Taking them home to the family party the next day, everyone seemed to like them (though I admit I also had a bunch of homemade cookies around as well). They could not compete with the chocolate crinkle cookies, but face it, those took hours to make and a sink full of dishes to clean afterwards. The young kids however loved these Girl Scout cookies, and will be looking for them along with all the old standard flavors still out there and on sale today to support the efforts of the local Girl Scout troops. Town Manager Jim Duggan joined us on WCAP to talk about some of the Town Meeting warrant articles for the upcoming fall town meeting. Looks like Phil Thibault has a lot of new Dracut business coming in. As an architect, he has decided that the additional work he is doing in town will have a conflict with his role on the Planning Board, so felt it was best for him to leave that position. 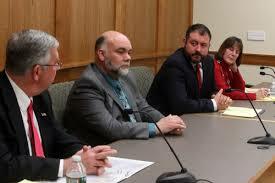 Here I post the interview we did with him yesterday on 980 WCAP radio. Once again, just in case you missed it, here you get the actual interview unedited, unbiased and complete..
Great show yesterday morning as Selectman (and former Fire Chief) Joe DiRocco came in to give a strong opinion on the recently released Fire Department Risk Assessment , mostly about the anonymous quotes attributed to firefighters that were included in the public release. Partway through the interview, former School Committee member and Police Officer Mike Miles called in to also attack the ethics of the choice of the interim police chief.. being that he was part of the team that did the assessment on the police department. Great discussion, that I’m sure will continue over the next month(s). And here you can listen to the actual interview, rather than just what others say about it. 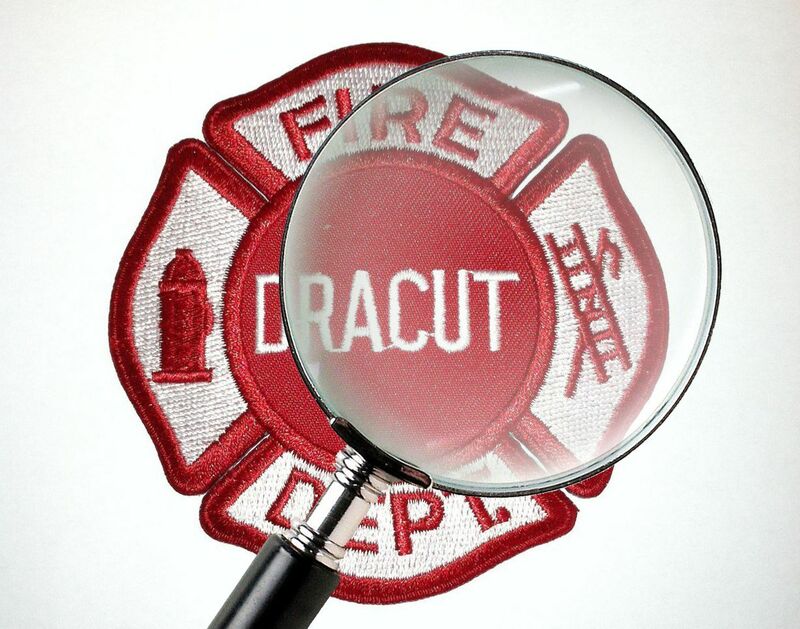 Here I post the Risk Assessment report that was recently completed on the Dracut Fire Department. This will be discussed over the next few weeks on many venues, so its best to have the source material on hand. I’ve done a cursory review of the fire department risk assessment compilation of recommendations. Internal strife? Haven’t been hearing about that around town. There are a lot of items that are what I consider internal to the department.. operating procedures, equipment, facilities. We expected those recommendations. There are some interesting recommendations here: addina a deputy chief who is outside the union and removing the chief from civil service are first. Second, they recommend breaking the union into two.. one for the lower level firefighters and one for the “managers” who supervise them. This makes the grievance process more fair, as the same union is not involved in both sides of a grieveance. An updaed policies and procedure manual, SOP, etc, is always a good recommendation. A new firestation for Collinsville, we already have in progress. The reviewers are advocates of the regional dispatch center (which financially doesn’t seem to be going anywhere yet). Staffing, of course, should get to 3 people on a truck. There are some significant issues with regard to EMS serviices, especially important as we are in the middle of an ambulance contract (and possible switch to a new service provider). More methods of communication.. we get it, you can always use that. One recommendation is periodic, what we call where I work “skip level meetings” where the chief would meet with all the members of one unit in an open discussion. There is a whole section here that seems to imply there is a lack of communication.. calling for the cheif to “adopt a more inclusive management style” and make the officers meetings “an open and honest exchange of information”. I’ll post the entire reports later for your perusal. The Lowell Sun political gossip column this moring headlined with the Dracut Town Meeting discussion on the article about removing the Police Chief from civil service. 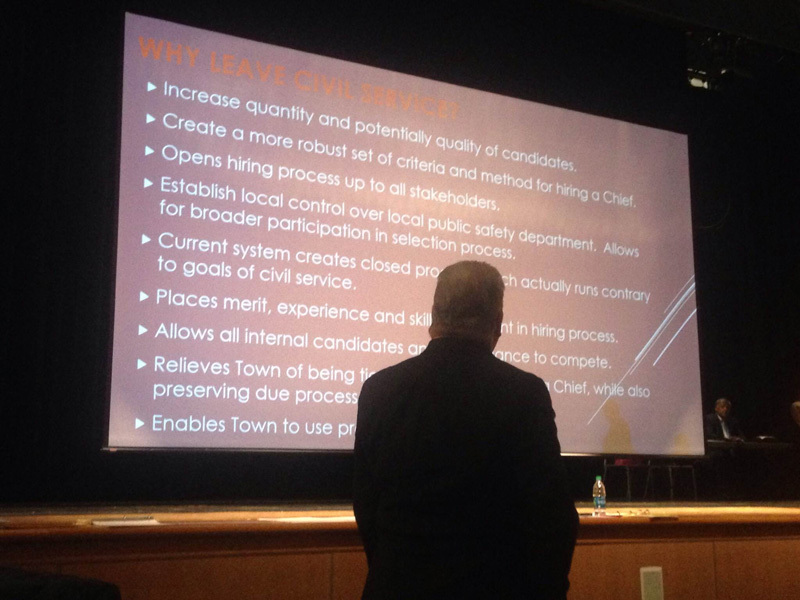 For an issue that would not apply to him, Chief Richardson seemed to take it most personally, and all the officers in the audience seemed to have an ongoing grudge against former police officer, now Selectman Tony Archinski. 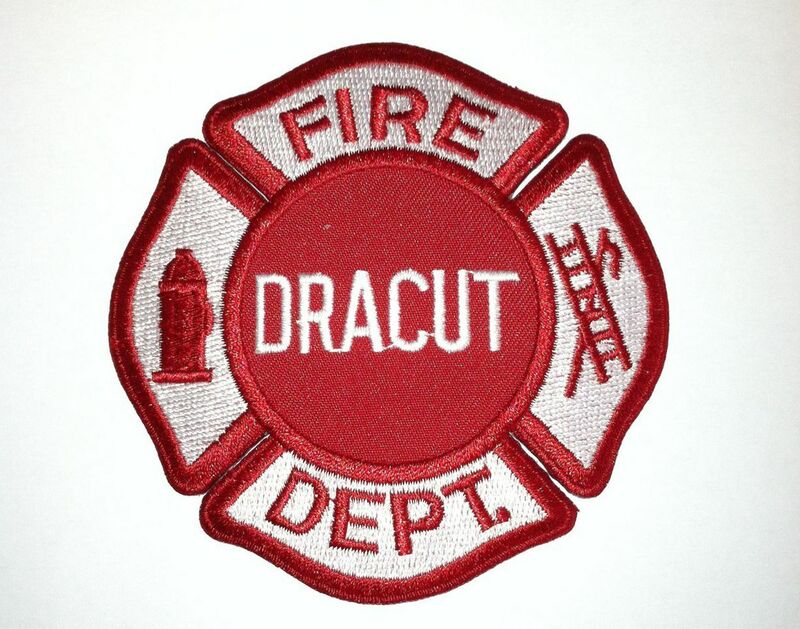 MONDAY WAS not, perhaps, the finest night for Dracut’s finest serving as role models. A large contingent of police officers, firefighters, and their families marshaled for Monday’s Town Meeting to strike down Town Manager Jim Duggan’s proposal to remove the police chief’s position from Civil Service protection. It was an emotional night, and at times the animosity seemed to boil over. For one, Selectman Tony Archinski, a retired police officer who was once passed over for the chief’s position and is no friend of the current police leadership, stood to speak in favor of the proposal. Boos rained down from the corner of the auditorium where police officers were sitting. Police Chief Kevin Richardson said, “Oh, this a******,” loudly enough for those sitting near him to hear. As Archinski wrapped up, Richardson joined the chorus of dissent and yelled at him to sit down. The chief appeared to be in a snarky mood throughout the night. 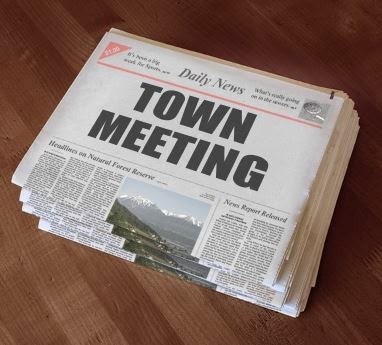 The tenor of the meeting seemed to degrade as the debate went on, eventually prompting Town Moderator George Malliaros to cut short iscussion and declare that the vote would be taken by secret ballot to ensure that residents felt comfortable voting. Boos again erupted from the Civil Service supporters. Someone in that section shouted that all voters should have to show their faces. The final vote: 278-198 against the change. On a vote of 198 for removing the Police Chief from Civil Service to 278 against, the article went down at a town meeting that started with a quorum of 392, and finished with 476 voters deciding this final warrant article by ballot vote. On other items, one citizen tried to amend the article that provided stipends for elected officials to zero out the amounts. By a standing vote, his amendment was defeated with 94 agreeing with him, to 233 against. Article 20 to increase the tax exemption for elderly that meet certain income and asset requirements from $500 to $600 passed just a easily. Helen Dunlap of the Community Preservation Committee withdrew their motion for funding to move the old Fox farmhouse on Broadway, noting that they tried a number of options to save the old house, but nothing came through.